New Moons are a time of visioning and nurturing the intentional seed we plant in the hidden depths of fecund darkness. Cancer is a sign associated with birth, the creation of new life from the wombs of mothers, the arising of a new season at solstice, and the development of our personal identity from the matrix of our soul. 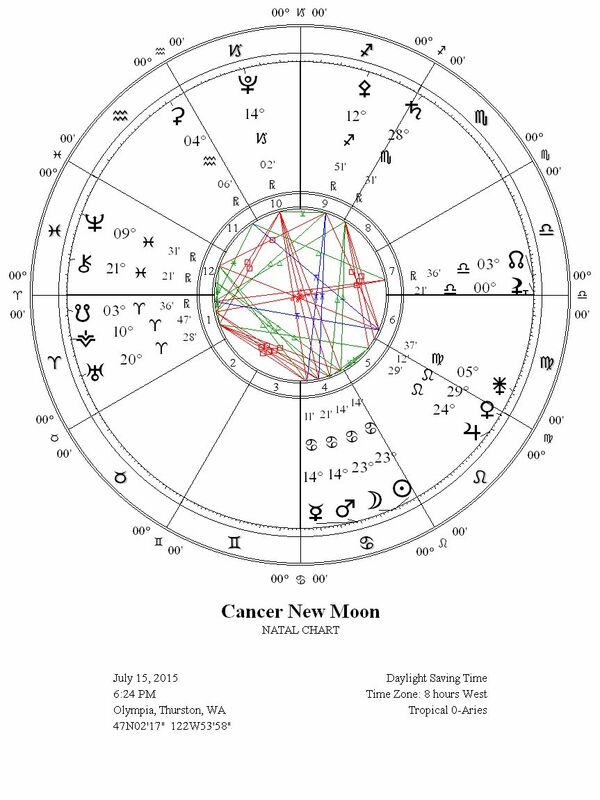 The New Moon in Cancer on July 15, 2015 falls in the final decan of Cancer and brings to our awareness a sense of separation from sources of past comfort and a vague dawning of realization into the new direction arising out of this dark genesis. Creating a new lunar cycle following a Full Moon in Capricorn that was conjunct Pluto on July 1, this New Moon in Cancer resurrects the potency of the seven squares between Pluto and Uranus we have lived through in the past several years, as it is square to Uranus in Aries while Mars and Mercury are conjunct in Cancer and directly opposite Pluto in Capricorn. 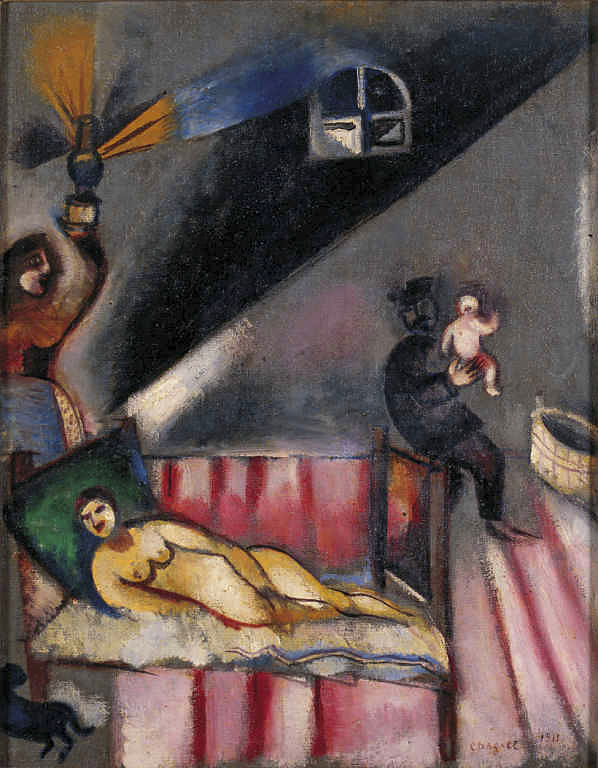 As an infant must bravely breathe in air separated from the sheltered nurturing of the womb, so must our identity shed the comfort of past security attachments if we wish to embody the full radiance of our potential in the moment. Amplifying the air with instinctual individualism is a Uranus currently stationing in Aries, standing still by zodiac degree from our earthbound perspective and preparing to turn retrograde in less than two weeks. Since the New Moon in Cancer is separating from a square to Uranus in Aries, it triggers the discomfort, insecurity, anxiety, or fear that can strike from within when we realize that the burning force beckoning us to embody a liberated presence creates the possibility and even likelihood that we will become disconnected in the process from our ties to family, culture, and other elements of the accustomed reality we take comfort in. We may find it necessary now to create a sacred space of some sort to nurture the vulnerability we feel in the unfolding of our current creativity. Even when we consciously have desire to free ourselves from the conditioning of culture and the way we felt our family of origin limited our full creative actualization, a fear of losing the security we gain from our relationship with these same influences can still overcome us. In addition, due to sensitively observing authorities in positions of power taking advantage of the more vulnerable, we can also come to fear the potential impact of expressing our full power into the world around us. Synthesizing together the strength that can come from hard aspects between Cancer, Capricorn, and Aries, we can ultimately learn to take the responsibility for expressing our personal power in a way that protects and empowers ourselves and our relationships. Yet the calamitous aspects held by this New Moon of Mercury conjunct Mars in Cancer and opposite Pluto in Capricorn, with Saturn in Scorpio in square to Venus and Jupiter in Leo, means that there will be a number of oppressive power dynamics between people on display in our surrounding environment to observe and mediate. It is simply incredible that as the first images of Pluto enter our consciousness through the completion of the epic journey of the New Horizons spacecraft, Mercury is exactly conjunct Mars and in opposition to Pluto, while Saturn shapes structure in the Plutonic sign of Scorpio. 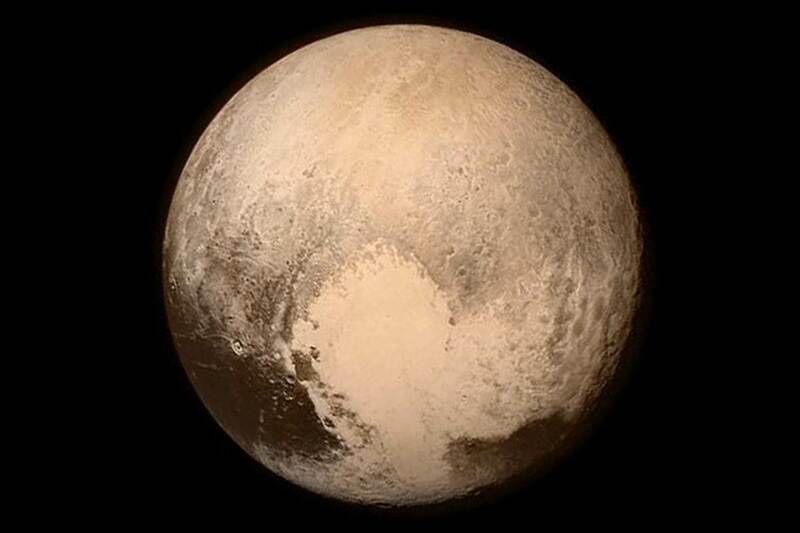 It is further fitting that this binary planet named for the Lord of Souls and the Ferryman of the Underworld claimed center stage in mainstream media in the dark of a balsamic Moon that was opposite Pluto. Whatever shift in collective consciousness happens as a result begins to build in accordance with a potent New Moon that places the messenger (Mercury) and will-force (Mars) of consciousness in a full polarity to Pluto. Due to a number of astrological factors, in the past couple of months there has been an emphasis on a new quality of Mars to exert through an influence of Mercury. Mercury is an unstable planet of wild extremes and variation in speed, and so while on the one hand it can bring challenges in our ability to focus our Martian drive, on the other hand when we align instinctually with their unified energy it brings the eloquent cleverness of Hermes to our life force of desire. With Mercury and Mars unified in polarity to Pluto, we need to be ready for the possibility of extreme power conflicts and emotional confrontations occurring around us. Yet on a personal level, there is also an initiation found in this aspect to journey into our core depth to discover a regenerated treasure of gifts from within to begin to integrate and express in the cycle ahead. There is a purification involved in this process, as Mercury is now under the beams of the Sun and preparing to enter into the heart of the Sun a week from now around the first quarter Moon, while Mars is also under the beams having already united with the Sun and beginning to get some clarified separation away from the fiery center of our solar system. Emotions may feel raw and overly sensitive, but are the material through which we can now gain penetrating insight into the core emotional patterns and compulsions most in need of attention. 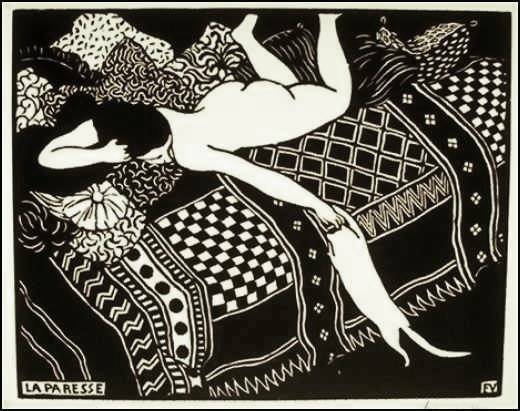 Meanwhile, our Queen of pleasure, luxury, and glamour, Venus in Leo, is slowing down and preparing to station at the time of this New Moon in Cancer. Venus is now at the final degree of Leo and in a few days will enter Virgo where she will station retrograde on July 25- meaning that basically for the next few weeks Venus is not going anywhere and holding space at the first degree of Virgo and final degrees of Leo. This would be intense under any circumstance, but is so even more as Venus is conjunct Jupiter and in a last quarter square to Saturn in Scorpio. As Saturn is stationing direct at the beginning of August and will also be standing still then, this means that from now through the beginning of August we get to experience the seriousness of Venus in a last quarter square to Saturn, while simultaneously buoyed with a sense of expansive vision by Jupiter. Venus now in Leo, soon to be in Virgo, in a last quarter square to Saturn in Scorpio, brings about a reorientation of our inner values that at times could feel severe as the scythe of Saturn cuts away the old value structures that must now be released. At this moment, we are only at the precipice of a deep transformation with many dramatic experiences coming our way. Thus, while we may feel a burning sense of desire through the union of Venus and Jupiter, their last quarter square to Saturn brings a constricting sense of an obstacle or major challenge standing between us and the full manifestation and experience of our desire. Powerful work on an inner level and on an outer level through our vocation and creative expression can come about through this aspect, but we are being asked to be disciplined, focused, organized, and thorough in our approach if we wish to realize the full potential available to us. This is not a lighthearted skip through the woods singing without a care in the world, but rather a courageous and focused trek into a deep region of the forest we have previously avoided exploring. This is not to say that it will not be possible to experience moments of pure pleasure and luxuriation, as in fact bringing a sense of joy to our daily experience will be a vital help. It is only to suggest that if we bring passion into our work with a sense of disciplined persistence to work through the upcoming obstacles, on the other side of these aspects we can experience a deep sense of fulfilled desire. The third decan of Cancer is ruled by the Moon and so is a potent place for a New Moon, a particularly auspicious new lunation to set intentions toward the new direction sensed from within. In the image of the 4 of Cups illustrated by Pamela Colman Smith above, we see someone sitting on the roots of a tree with three golden cups ready to be filled in the foreground, with a fourth cup being magically offered out of thin air by an otherworldly hand. The recipient of this magical offering appears to be engrossed in contemplative thought, and appears to either not notice the fourth cup or be dismissive of it. In fact, this protagonist’s stance of crossed arms, crossed legs, and eyes cast down suggests someone unwilling to go after what is being offered, perhaps until after completing an inner exploration. 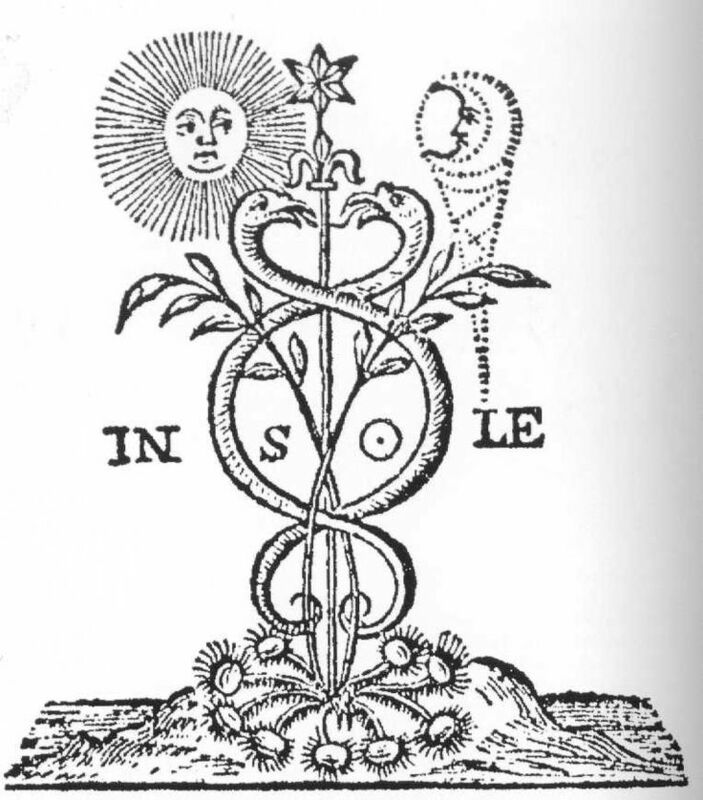 Austin Coppock in his book on the decans 36 Faces found that the third decan of signs are synonymous with the “Solve” phase of separation in alchemy in which “the constituent pieces must part ways,” similar to “the spirit forced to separate from the matter,” and “those factors which press for an abandonment of the balance created in the second” decan of the sign (p. 264-265). Along this line of thought Coppock gave the image of “The Overflowing Cup” to the Cancer III decan, declaring that it “juxtaposes the advantages and dangers of luxurious excess with the truth of scarcity” (p. 115). Our cherished sense of luxury we desire is shown in contrast here to a sense of scarcity rooted in “a world of limited material resources” in which “the attainment of luxury for one entails deprivation for others,” leading to a “hidden violence and secret competition entailed within the quest for luxury” (p. 116). 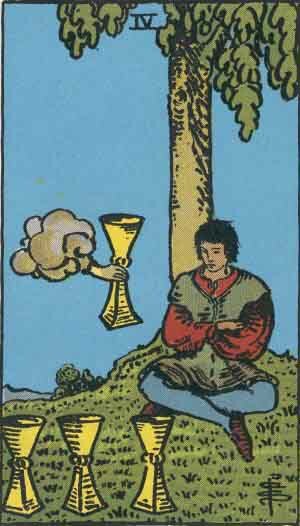 Coppock noted this seems to be the perspective of the young man seated in the 4 of Cups tarot card with an ascetic air of refusing to accept more than he needs, and therefore bringing up questions around choosing the extra cup of luxury. 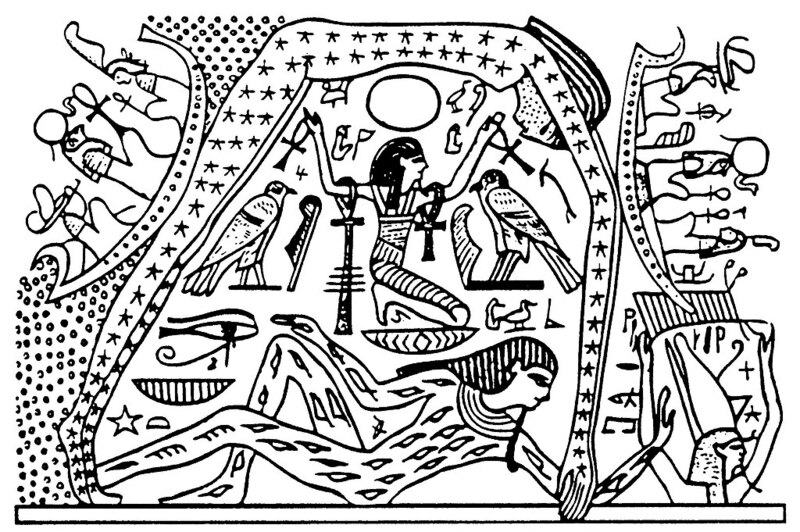 Resonant with cycles of creation and destruction that bring limitless luxury and spiritual gifts, Coppock also noted that the Hellenistic text The 36 Airs of the Zodiac connected the great goddess Hekate with the Cancer III decan. Hekate ruled over the three phases of the Moon, all realms of the upper world and the underworld, and also crossroads, magical craft, and prophetic mediation among many other significations. In short, we could not have a better spirit to associate with the dark richness of this Plutonic New Moon than Hekate, and it is worth remembering there is a long tradition of praying to Hekate in order to receive wealth. Hekate is also a goddess of midwives, and therefore an apt ally for us in the intense birthing process that will follow this Cancer New Moon.